Limited collection! 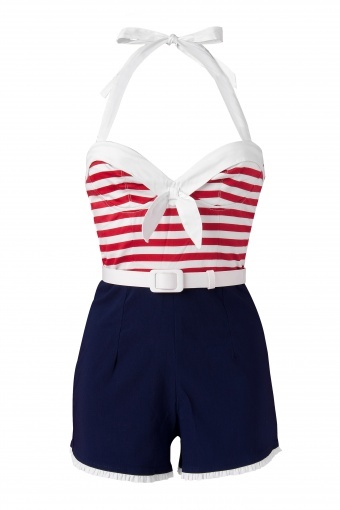 Sailor Playsuit with Red and White Strips and Ruffle Trimmed Navy Bengaline Shorts by Pinup Couture - Nautical Playsuit with Red Stripes and White Poplin Trim. When you're not actually going into the pool, but would like to romp around looking adorable, this playsuit is the way to go. The halter top is padded for structure, then finished off with great fitting bengaline shorts, this nautical romper will be your favourite summer look. Complete with a 1 inch White Slide Belt.